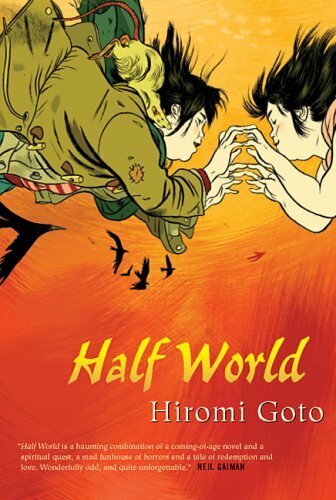 A journey of fierce struggle, marked by macabre characters and dangerous feats, is the subject of Half World, the latest offering from veteran writer Hiromi Goto. When Melanie Tamaki’s mother disappears into a violent purgatory called Half World, she does what any teenager in a book for young adults would do—she follows her. Melanie learns soon enough that she’s the missing link needed to restore ancient balance between three mysterious realms: the Half World, the Realm of Flesh and the Realm of Spirit. Melanie is neither a likeable nor unlikeable character. Rather, readers receive only small glimpses of the 14-year-old’s personality, learning little about the effects of the peer ridicule she endured or the complexity of her relationship with a neglectful mother. However, Goto makes up for this lack of character examination in her vivid descriptions of Half World, a colourless realm where those trapped inside are destined to repeat moments of great trauma that ultimately break their spirits. Goto’s dramatic imagery is coupled with haunting black and white illustrations by Jillian Tamaki, who gained recognition last year with her critically acclaimed graphic novel, Skim. Goto has written a number of prize-winning books, including A Chorus of Mushrooms (1994) and The Kappa Child (2001). While Half World is written for a juvenile audience, Goto’s masterful storytelling will charm readers of all ages. On the surface, Half World comes across as a dark adventure story, but on a deeper level, the relationship between spirituality, religion and the lure of the unknown becomes more apparent. Reviewed by Jessica Rose in Ricepaper Magazine Issue 14.3. Jessica Rose is a writer and editor, living in Hamilton, Ontario. She edits children’s books by day and writes book reviews by night. She is a regular contributor to rabble.ca’s book lounge, and she has also been published in a number of magazines, including Hamilton Magazine, Blackfly, and Educated Solutions. She is a graduate of Carleton University’s School of Journalism.